A multi-million pound investment in rail services in the county has been welcomed by Lincolnshire County Council. Today (Wednesday) East Midlands Trains, which will continue to run services between Lincoln, London, East Midlands and South Yorkshire until March 2018, announced a £13million investment in services for rail passengers across the area including in Lincolnshire. The news followed an announcement from government rail minister Claire Perry that extra funding would be ploughed into rail services in East Midlands. The money will go towards improvements such as extra services, cheaper fares and better journeys. The move was welcomed by executive member for highways and transportation, Coun Richard Davies, who said: “Better transport links for the people of Lincolnshire to other parts of the country are at the top of our agenda here at Lincolnshire County Council so we welcome news of this investment. We look forward to working with East Midlands Trains in coming months. 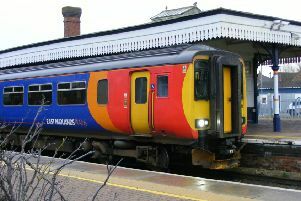 In May this year weekday East Midlands Trains services between Lincoln, Hykeham, Nottingham and Newark were significantly improved following more than £2million of local and central government funding partly from Lincolnshire County Council.